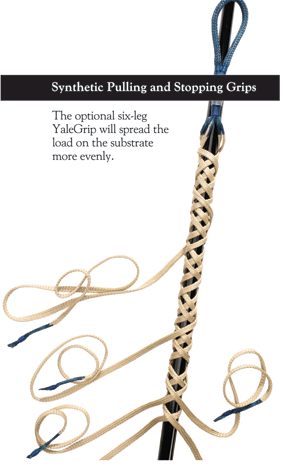 YaleGrips™ are made from a Technora® flat braid, an Aramid fiber, assembled in a four-leg configuration extending from a reinforcing, securing eye. The eye is covered entirely with an extra layer of braid, which is saturated with Maxijacket™ urethane, abrasion-resistant coating for extended life. YaleGrips are used for permanent strain relief on cables. 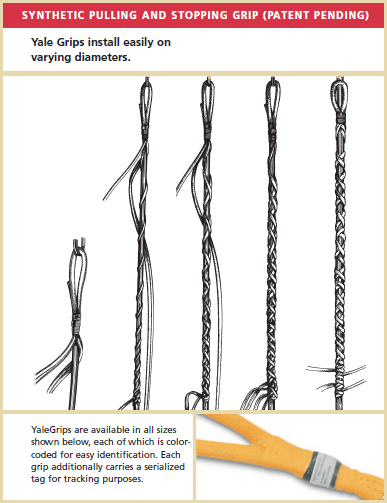 YaleGrips are applied quickly over a wide range of cable diameters without specialized tools. YaleGrips are non-corrosive, have good dielectric properties, and are compact and lightweight. Installed, the grip remains flexible and does less damage to mating surfaces than other types of grips. YaleGrips are far stronger than wire mesh grips and do not form dangerous “fishhooks,” as do wire mesh grips, making them safer to handle. YaleGrips may be used for temporary or permanent eyes, both in mid span or on the end. Options include urethaning the entire grip, which extends the grip’s life, especially useful in active towing applications. We call this the “marine treatment” (part numbers shown below). Grips can also be made with extended tails to accommodate larger cables. Hardware can be added to the eye, such as stainless thimbles, which enhance performance. Size the grip by anticipated loads, not by the cable size they fit. When the anticipated load needs to be spread over a wider surface area, a six-leg grip is suggested. Please call or e-mail for a quotation. The six-legged YaleGrip is the best way to handle an umbilical as point compression loads are minimized. The six-legged grip has the same tensile rating as the four-leg model but spreads the compressive forces more evenly across the surface. The six-leg and the four-leg are both available with our optional Maxijacket marine coating. Larger-sized cables may be accommodated by lengthening tail dimension (“L”). Please call or write to us for a quotation.